Working in confined spaces implies great risks to the worker’s health and safety. It requires very specific safety regulations, because confined spaces are usually not designed to be areas where people work for long periods. According to the British Health and Safety Executive (HSE), a number of people are killed or seriously injured in confined spaces each year. “Those killed include people working in the confined space and those who try to rescue them without proper training and equipment.” (See Confined spaces: A brief guide to working safety 01/13). Examples for confined spaces are chemical storage tanks, pits, pipes, chimneys, silos, trenches, tunnels, containers, pressure vessels or other similar enclosed or partially enclosed structures. Working in confined spaces is linked with many different potential dangers. Some of the above mentioned conditions may already exist in confined spaces, although some may also arise during the work process, or because of ineffective isolation of plants nearby, e.g. through leakage from a pipe connected to the confined space. The enclosed workspace may also increase dangers arising from the work being done; for example, by machinery which requires special precautions such as dust extraction, or provisions against electric shocks. Gas, fumes, or vapours can develop from welding or by using flammable solvents, for instance. There have been numerous severe accidents in recent years which demonstrate the hazards in confined spaces, particularly in mining. In September 2009, a methane explosion in a Polish coal mine killed 17 miners and left 35 severely burned. An unexpected buildup of methane triggered alarms too late, and a flash explosion scorched the men underground. In April 2013, nine miners were injured in a coalmine in Ibbenbüren, Westphalia, Germany. They suffered eye injuries and skin burns because of corrosive dry concrete. The accident happened in the morning at about 1,400 metres’ depth at the north shaft of the mine. Dry concrete was transported from a warehouse above ground in steel pipes directly to the site. The shafts were reinforced with the building materials. For unknown reasons the dry concrete was released as 38 miners were on their way to their work. The powder had an acidic reaction with their eyes and greatly irritated their skin. Working in confined spaces puts workers under stress which can lead to panic attacks. This aggravates the situation immensely, as the workers are likely to react in a less considered way, which can lead to a severe accident. Panic is a strong stress reaction of an individual to a dangerous and frightening situation, possibly leading to a restriction of our higher human capabilities. People tend to lose self control in panic and subsequently control over the broader situation. In difficult circumstances of acute and real danger, this can become life threatening. During panic attacks, automatic reactions, or reflexes to dangers play an important role. Reflexes play an important role in coping with immediate threats. A reflex is an involuntary, rapid reaction of an organism to a specific stimulus. Reflexes are neurally mediated and are saved in our stem brain. Through evolution humans have always used their instincts when confronted with danger, e.g. a man either decided to attack the wild animal standing in front of him or – what is more likely – ran away. In any case, his reaction was based on an instinctive, automatic behaviour and not on conscious planning. Nowadays reflexes are obstructed, since we face many technical dangers, but reflexes are usually fixed in our personality. Here is an example which clearly illustrates our reflex mechanism. Imagine you are climbing onto the roof using a ladder and the ladder slides away. What would you do? About 75 percent of people would hold onto the ladder. What makes us do this? It is a reflex. Another good example for a reflex can be found in a situation where somebody is about to fall down the stairs. Automatically he or she will try to clutch the handrail and will most likely not have an accident. If we habitually hold the handrail while going downstairs, we automatically hold onto things we have in our hands. The same applies to the escape reflex of the forklift driver in an accident at work. It is a well known fact that the most common cause of death for forklift drivers is to be struck by the roof. This happens because the drivers automatically jump out the wrong side when the forklift tips, although they actually know that this is more risky. Reflexes cannot be simply worked off or altered into conscious behaviour – only technical systems holding back the workers are able to help in certain emergencies. Reflexes constitute about five percent of our actions; the rest is routine and conscious behaviour. Only about 10 to 15 percent of our actions are based on conscious behaviour. How do we behave when we act consciously? We are highly focused, all our senses are alert, and we are able to realise the potential danger we are facing. We are completely aware of the consequences of a given situation and act accordingly. Each action carried out for the first time happens consciously. Through repeating it, the action develops into routine. The greater part – about 80 percent – of our actions happen in a routine way. We do not perceive potential risks anymore if we deal with a familiar situation. It becomes a habit and we tend to ignore the dangers and their possible consequences. We are less concentrated, our minds wander, and we act on autopilot. Routine behaviour presents a threat to our safety in dangerous situations, since we are not alert and ‘conscious’ anymore. On the other hand, it is important for our daily life that we sometimes act in a routine way, otherwise we would not be able to meet our everyday obligations – it would be too stressful for our minds to fully concentrate on recurring tasks again and again. These automatic actions help to keep our heads clear for important things, e.g. when things happen unexpectedly. Then we are challenged to solve the problem and our consciousness begins to work. (GEO kompakt issue 36/2013 ’Unsere Sinne: Wie wir die Welt wahrnehmen’, pp 100-107). Safe routines can also protect us from dangers. If we have a correct and safe scheme in our minds and use it appropriately, work becomes safer. Problems are only raised through dangerous situations in which we do not refer to our safety scheme. We will not be able to react quickly then or our reaction will be unsafe and cause an accident in the worst case. In this context it is necessary to analyse the way we perceive situations. Most of the signals we receive remain in our unconsciousness until they enter the higher spheres of our cerebral cortex. All signals go through the same ‘door’, but lots of them never reach our consciousness. All these signals or impressions leave ‘marks’ in our unconsciousness, however. Our unconsciousness is a ‘helpful servant’, quickly recognising people, objects, and situations based on former experiences. It classifies these signals and guides our actions accordingly. Everything we do is filtered by our unconscious, deciding at the same time which action will be positive, bring happiness or pain. (GeoKompakt 15/2008. ‘Wie wir denken: Das Gehirn: Intelligenz, Gefühl, Bewusstsein’, pp 103-115). If they act consciously, human beings are able to cope with dangerous situations safely. Hazards arise when we act in a thoughtless and routine way. For this reason, one crucial aspect of realising safety at work is a thorough training of the workers. Only by pointing out real dangers at work in specifically designed training, such as safety walks and safety talks, can employees become aware of dangers. Most accidents at work happen because of human error and not because of technical defects. The employees have therefore become the focus of attention in safety work – apart from technical and structural measures. The intensive safety training carried out by professional firemen serves as a good example of effective measures. Firemen prepare themselves properly by training their behaviour in realistic dangerous scenarios – this way they are not only able to train their capabilities and reactions, but also to develop good routines. CHEMPARK, is a large chemical park in Europe with more than 70 companies specialising in production, research and services. It holds regular training for its rescue teams in Leverkusen. 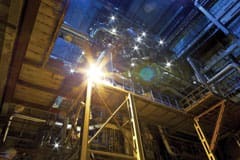 Working in confined spaces is quite common in chemical production sites – in cleaning or maintenance work, for example. Despite strict regulations for the protection of the workers accidents cannot be completely ruled out, meaning every minute counts in saving lives. During CHEMPARK training, an incident with a worker cleaning the inside of a container was simulated, which challenged the capabilities of the special rescue team of firemen and medical services. They had to save the ‘injured worker’ via an entry of only about 50 centimetres’ diameter, wearing their full safety equipment. The rescue training was a great challenge and difficult task, which the rescue ream mastered as well as the medical staff. (www.chempark.de/de/rettung-aus-bahnkesselwagen.html). Employees must train escape routes on a regular basis, particularly in the mining sector, otherwise panic and instincts can lead workers in the wrong direction. An example for the possible consequences in neglecting regular training was a company which set off an unannounced alarm. The result was that about 30 percent of the employees ran in the wrong direction and would have surely died in a real emergency. If one cannot avoid entry into a confined space, it is essential to implement a safe system for working inside the dangerous space. Employers should use the results of their risk assessments to help identify the precautions they need to take in order to reduce the risk of injuries. They should also make sure that the safe system is put into practise and functions at all times. Each worker involved has to be trained properly, so that he or she knows what to do in the course of normal working operations, and in the event of an emergency situation, too. Intensive training and the development of good behaviour are both essential for the employees’ safety when working in confined spaces. Transfer of knowledge, for example, about the applicable personal protective equipment (PPE), is not sufficient. Knowing about safety regulations doesn’t automatically mean workers apply it in practise. Knowledge alone does not change behaviour into safe and good habits. Employees should therefore be actively involved, by leading discussions on safety, for example. Workers should get the opportunity to be active, discuss, exchange information and experiences, and analyse threats and their causes. They should able to define the rules of conduct. The participation of the workers in safety talks has a positive effect which should not be underestimated – the rules which they determine are their own rules are easier for them to accept. Through conversation, ‘good habits’ can be developed, which comply with applicable laws and safety rules. As a result, employees will awaken themselves to danger again. They will be working safely and they will not put themselves or their co-workers at risk. This way they are able to get rid of bad routines. These conversations can also be conducted spontaneously or during onsite visits. Companies with a strict set of rules tend to have many, e.g. driving with signalling speed around the world factory premises. Companies with less strict regulations would allow normal speed, and maybe signalling speed only in designated areas of the premises. No matter how strict the regulations are, it is important that the employees abide by the rules and that the management controls them. This may cause resistance, but without control of safety rules, a change of behaviour is not possible, because humans are not keen on giving up amenities and habits they have come to like. The main goal of safety work is to sensitise, inform, and train the workers in order to change their attitude towards safe behaviour at work. Identifying and reinforcing positive and safe behaviour is the most important objective of this training. At the same time, workers have to be made aware of their unsafe behaviour in routine jobs, so that they are able to alter it into good behaviour. Consequently, safety talks and training are the most effective strategies for increasing safety awareness at work.